Declan Devine wants to restore pride in the Derry City jersey this season. DECLAN DEVINE is hell-bent on making Brandywell Stadium an intimidating venue for visiting teams once again and has warned his players he won’t tolerate mediocrity. 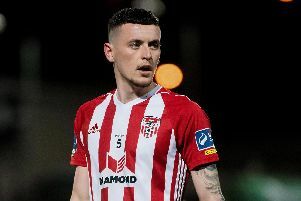 The Derry City players came under fire last season for appearing to crumble at home as they ended their Brandywell campaign with seven defeats from eight - the sole victory in that demoralising run against First Division side, Cobh Ramblers in the EA Sports Cup Final. For too long the venue has been a happy hunting ground for visiting teams and Devine is determined to make it a hostile location as he stresses the need to quickly restore pride in the Derry City shirt and instil a fighting spirit in his new-look City team. “This is our time to set down a marker and say ‘We’re not going to be intimated in our own backyard anymore’ and we’re not going to stand for mediocrity,” he warned. “When teams leave the Brandywell this year they better leave knowing they’ve been in a right good battle. “We have to fight for things again. Brandywell is based in an area of high deprivation and people in this area have had to fight and work for everything they’ve ever had and we have to do that as a club. “The hardest part for me, as an outsider looking in, was the amount of clubs who came here and didn’t have to do an awful lot to win. That’s not a reflection on anyone apart from the playing staff last year. They accepted it! Declan Devine and the Derry City team took a guided tour of the City Walls last Sunday to get a feel for the history of the city. With much of his squad from Derry or Donegal and the rest drafted in from as near as Belfast, Dublin and Armagh, or as far away as Scotland, England and even Argentina, Devine has been working hard at establishing a sense of togetherness within his squad. Derry City Football Club is very much a part of the fabric of the community and in a year which marks its 90th anniversary and the 30 years celebrations of the historic treble winners, the City boss has a real desire to reconnect with the Derry people and bring back a sense of identity. For the benefit of the ‘outsiders’ in his newly assembled group, Devine took the team on a walking tour of The Derry Walls on Sunday afternoon to get a feel for the city. The Past, Present and Future event at Magee last Friday night gave those who were unaware, a taste of what it means to play for Derry City and its remarkable history. The Derry City team pictured following their Tour of the City Walls. And the Creggan man wants his players to show the same passion and fighting mentality, he believes, the people of Derry are renown for. “We have to get back to what the people of this community have had to do all their lives and that’s fight for everything. There are not many jobs in Derry and the people in Derry have had to suffer so many setbacks over the course of the last 50 years. We’re trying to breed that into our players that this is what we’re about as a football club. We are people who have had to fight, that’s the Derry mentality. There’s a refreshing, renewed air of optimism among Derry City supporters ahead of the new campaign against a backdrop of underachievement, frustration and a season which brought about the worst defensive record since entering the League of Ireland. Devine didn’t need to be a football genius to figure out where he needed to focus first as he steadily built from the back. With just four players on the books he’s overseen an unprecedented overhaul of the team by adding another 15 bodies to make up the class of 2019. That recruitment drive can’t be understated given he only used 35 different players during his previous two year stint at the club. He understands the workings of the club and its place in the community more than most having been involved for the guts of 13 years. As a player he was understudy to Tony O’Dowd and played just 17 times for the Candy Stripes since making his debut at Brandywell against Sligo Rovers on August 21st 1996. He was part of the’97 league winning team but it was as an assistant boss and manager where he made his biggest impact. From 2012-2013 he managed the club a total of 90 games, reaching the final of the Setanta Cup, losing a penalty shootout with Crusaders at the Oval, and winning the FAI Cup when defeating St Pat’s at the Aviva Stadium 3-2. While he’s realistic about the job at hand, he’s got a clear idea of where he wants to take the club and that’s challenging for trophies and competing in Europe but, for Devine, that’s a challenge for everyone associated with the club. “We want to be successful. We want to get into Europe and challenge for trophies but for us to do that we need full stadiums and for us to get full stadiums we have to make sure we’re winning games. Devine’s also prepared to sacrifice the pursuit of the playing ‘the beautiful game’ for winning ugly and adopting a win at all costs mentality this year. The Brandywell attendance grew weary of Kenny Shiels’ insistence on playing out from the back which, more often than not, exposed an inexperienced and short-of-confidence defence. “When the chance presents itself to play, we’ll play - we want to entertain. Style of play is very important but more important is winning football matches.